Rev Tech GTS 230w TC Box Mod Review - Daily Vaping Deals & The Best Vape Product Reviews at Vaping Cheap! Rev Tech is a fairly new company to hit the vape scene and today we’ll be taking a look at one of their latest releases, the GTS 230w TC Box Mod. 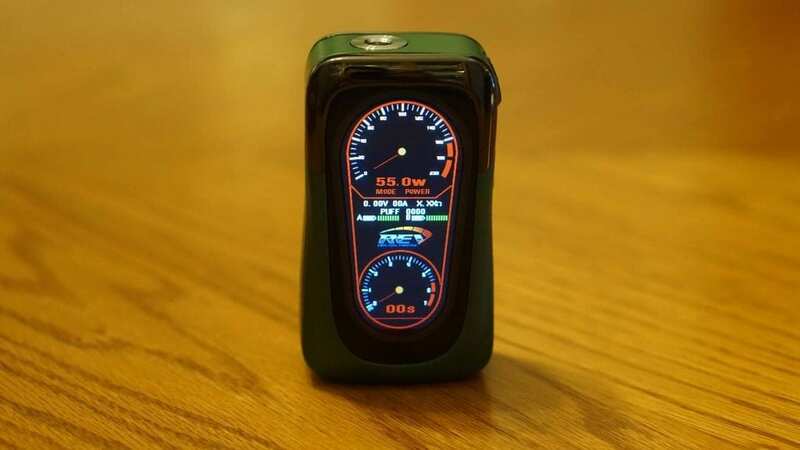 Although there are tons of dual 18650 box mods on the market today, this one differentiates itself with its large and unique display screen which resembles a speedometer. In addition, it has a dedicated menu button making it easy to access all of your settings or to change the color of the display screen on the fly. Before getting any further into this vape review, we’d like to thank UrVapin for sending this device our way for the purposes of this review. We’ll cover our first impressions, usage, performance, pros and cons and conclude with whether or not we recommend the Rev Tech GTS 230w TC Box Mod! Click Here to Check Out the GTS 230w TC Box Mod by Rev Tech! The GTS 230w TC Box Mod by Rev Tech comes in a standard box that is a bit large with an image of the device on the front. On the back of the packaging, you’ll find some minor information such as some of the features the GTS 230w TC Box Mod will provide. Everything inside of the box is kept secure, which is always a good thing. Aside from the device itself, in the packaging you’ll receive a QC card, a Rev Rubber key chain, a micro USB cable you can use to upgrade the firmware, a warranty card and a user manual. I’ve never really seen a company include a key chain before, so that’s definitely a nice touch. Once you slide open the box, you’ll be met with the Rev Tech GTS 230w Box Mod and my first thought is that it’s certainly on the larger side, and a bit bigger than I initially expected. This is not a con by any means, just something worth mentioning as I know some of our subscribers do prefer a more compact device. I did receive the green color, but there are two other colors available which are Red and Blue. The screen itself is huge and certainly one of the biggest I’ve seen on any box mod, which may be a good or bad thing depending on your preferences. 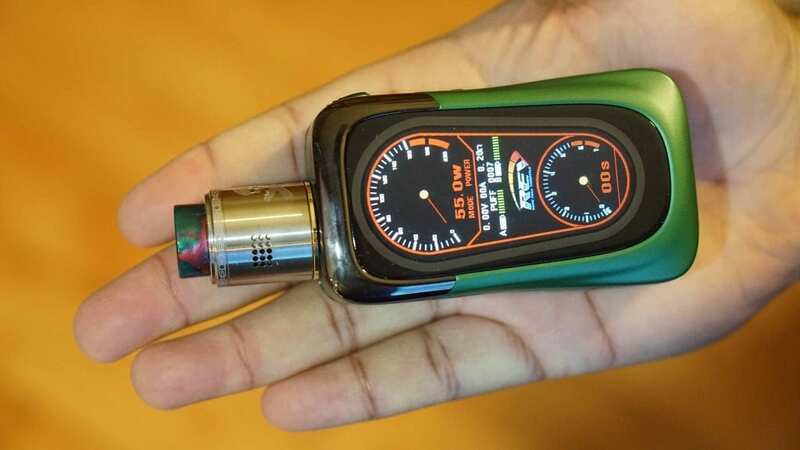 Some vapers like a more simple device with a smaller screen. When first holding the Rev Tech GTS 230w TC Mod, I immediately thought it was comfortable to hold. It’s very ergonomic and has no sharp edges to be found. On the battery door, there’s somewhat of a mesh design which adds a textured feel to it. All of the buttons are nice and clicky as well, which is a pro for me. There are four buttons to be found which are the fire button, wattage up and down buttons and a dedicated menu button. The fire button is the largest of course and the other 3 buttons share the same size. I would’ve like to have seen a minor size difference between the menu and wattage buttons, but it wasn’t a big deal. The micro USB port can also be found on the same side, but towards the bottom. Under the device is where you’ll find some venting. All in all, my first impressions of the Rev Tech GTS 230w TC Box Mod were great! I had no cons whatsoever to be mentioned when first checking out the device. As mentioned earlier in this review, the GTS 230w TC Box Mod does have a very ergonomic design, making it comfortable to hold and use. It is on the larger size, but I had no issues carrying it in my pocket, so you’ll have no problems storing this in your bag or purse. Honestly, I don’t mind it’s larger size, because of how great it feels in the hand, it really is that comfortable to use. This device is also very well made, and has no rattle whatsoever. Your batteries are held securely in place thanks to it’s magnetic battery door. I had zero issues with inserting my batteries and taking them out. In the battery tray there is a small area which protrudes a bit which makes sure that the battery door stays in place without moving, which is a nice addition. There is no play whatsoever with the battery door, and the magnets are pretty strong as well. The menu system of the GTS 230w Box Mod is pretty simple, but may take some time getting used to at first. 5 clicks will turn this device on, but when it’s on 5 clicks will lock the device where it won’t fire. By clicking the menu button, you can quickly change the color of the screen. When holding down the menu button for a few seconds, you’ll enter the full menu where you can choose which mode you want to be in such as TC, Bypass, adjust your TCR settings and more. You can also change the entire layout of the display screen, adjust the preheat settings and brightness, factory reset it, adjust the time and choose to fully turn off the device. When you want to exit this, simply hold down the menu button and you’re back to vaping. It’s not a overly complicated menu system, but it may be just a little overwhelming to the beginner. The display screen at it’s full brightness is not very bright, and you may find some issues seeing it outside in the daylight. I do wish you can make it brighter. Inside, you can easily see everything without any issues though. There are two speedometers on the display screen which actually moves as you vape, which I thought was rather unique. On the base screen, it’ll also show you your wattage, amperage, voltage, puff counter and resistance. If you leave the device for a small amount of time without vaping, it’ll go to its clock feature, which some vapers may or may not like. I do want to mention that some atomizers I have attached does have a gap, and I think it’s due to how the 510 connection is. Atomizers such as the Smok TFV12 Prince Tank will have a small gap, which isn’t very noticeable unless you’re looking directly at it. It’s not a huge gap by any means, but it’s still a con. I also would’ve have liked to have seen the 510 connection be centered. I will say that this mod will accommodate atomizers up to 26mm or maybe even 27mm without any overhang. Overall, using the Rev Tech GTS 230w Mod has been a pleasure. I did enjoy the unique display screen and its ergonomic design is what kept me coming back to keep using it daily. Now the biggest question of this review is how well does this vape mod actually perform? The Rev Tech GTS does have a maximum wattage output of 230w and while I don’t have the necessary equipment to actually test if it hits this wattage, I can say it does feel as if it’s hitting near the 200w mark. If you are vaping at these higher wattages, be sure to be using 2 good high drain 18650 batteries. 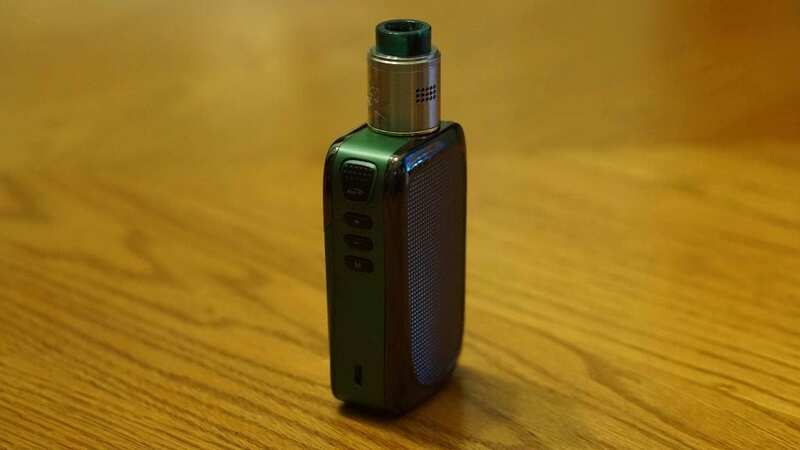 I don’t really vape that high of a wattage, but if you are the vaper who tends to vape at 150w and over, I would definitely say a triple or even quad 18650 box mod is more likely to satisfy your needs. The reason why is that when vaping at higher wattages with a dual battery mod such as this, you’ll plow through battery life incredibly quick. Regardless, I think this device will satisfy the majority of vapers since it does feel as it’s delivering near 200w in my opinion. This box mod does feature temperature control for various wires including Ni200, Ti and SS. It also has a TCR mode allowing you to fine tune your vape experience. In addition, when selecting stainless steel temperature control you have the option of choosing between SS304, SS316 and SS317. The temperature control performance of this device is not the best in my opinion, and you can’t control the wattage output in TC mode either which is a con for sure. If you’re more of a TC vaper, I’d definitely recommend a DNA box mod. I don’t vape much in temperature control mode, so this wasn’t an issue for me, but it’s still worth mentioning for you vapers who like TC mode. This device is firmware upgradeable, so hopefully in the future we see an update that fixes the performance and allows you to change the wattage as well. Something else worth mentioning is that when this device is left idle for a bit without you vaping it, it’ll take a second to “wake up” and then it’ll fire, so there is a small delay. The battery life of this device is on par with most other dual 18650 box mods on the market. When vaping between 60w and 70w, I could easily get this mod to last me a full day. If I were chain vaping, then probably half of the day. If you are vaping at higher wattages such as above 100w, do expect less battery life. All in all, the performance of the Rev Tech GTS 230w Box Mod was good. Although it didn’t have the best performance in TC mode, the wattage mode performance was satisfying. All in all, the Rev Tech GTS 230w Box Mod is surely one of the most unique vape mods on the market today that offers good performance at a great price. It’s very comfortable to hold and use for extended periods of time, and I simply love the display screen, and this is what makes it so unique. I will say that this type of device isn’t for everyone when it comes to aesthetics, but for me, I do enjoy its overall looks and design. There were a few cons to be mentioned as no device is perfect. For one, it’s TC performance is not the best and this is probably the biggest con. For me, it wasn’t a big deal since I mostly vape in wattage mode. The gap with some atomizers and the slight firing delay aren’t too big of cons in my opinion as the delay only happens when it’s “asleep” and the gap is not that noticeable. This mod is firmware upgradeable, so most of these issues can be fixed. If none of these cons are deal breakers for you, and you’re looking for a unique box mod that has a large display screen and is comfortable to use, then I can certainly recommend the Rev Tech GTS 230w TC Box Mod. It has been a pleasure to use this device, and I do see myself using it in rotation with my other favorite box mods. We hope you find this review helpful in finding the right vape mod to fit all of your vaping needs! Feel free to leave any questions or comments down below! Thanks for reading!